I first tried Greek Moussaka at a friend’s place and immediately fell for it. She was kind enough to share the source and recipe. It is a complete meal on its own and I love the fact that it is a perfect side dish to out otherwise main course eastern dishes. 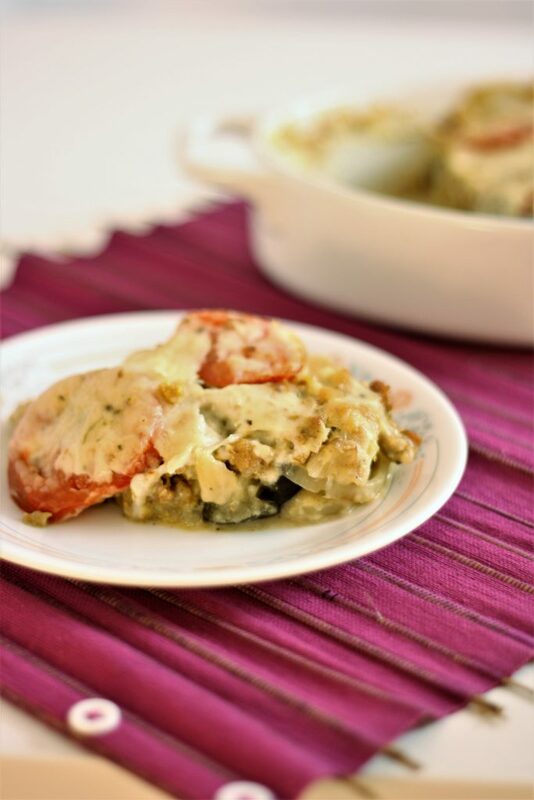 Is Greek Moussaka Healthy/Low carb/ Keto? using cream and cheese in combination with eggs to make the rich sauce for layering. Hence it can be keto friendly. Is Moussaka Turkish or Greek? When I heard and made, it was called Greek Moussaka and various sources suggest that it is not a Turkish but Greek dish though it is found in Turkish cuisine also. I have added my desi twists by making mince more spicy and added crushed red chilli in sauce. 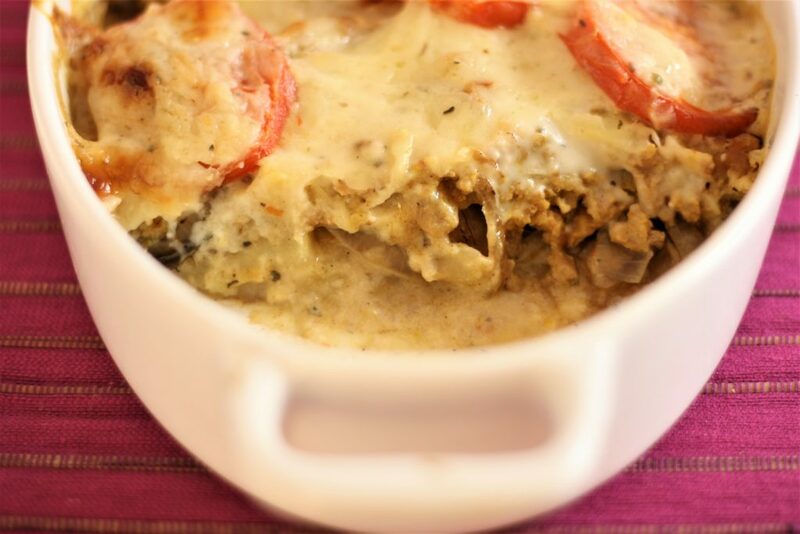 What to serve with Greek Moussaka? A salad is best, some garlic bread is perfect with a soup to complete the meal. Talking in terms of brunches and dinners, its a great main course. You can even make ahead and bake it on the day of serving. 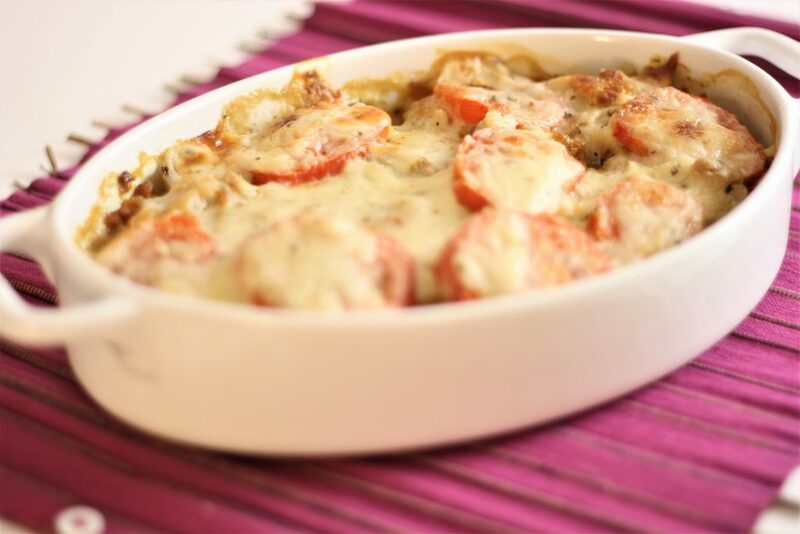 Recipe uses same mince meat and cheesy white sauce which can be found here. Heat 1 tablespoon oil with 1 tablespoon butter in a saucepan. Saute potatoe s till half tender. Prepare a deep dish by lightly greasing. Place the potatoes slightly overlapping. Before lining onions, spread mince meat. Line onions, and uncooked seasoned tomatoes. Pour white sauce on top. Bake in a preheated oven for 30 minutes until cheese is golden and bubbly.